In honor of the late Mr. Podoloff former NBA commissioner and lawyer , I would like to make a case for a candidate to receive this award. No , I do not have a vote (this year) but I believe I share the opinion of people who have seen enough of the fuckery. To me this race to hoist this trophy is like a bird against a worm , no contest. Do not let the NBA fool you by dragging the announcement of this seasons award winners. This is a ploy to keep you the viewer interested in the product they are pitching. The NBA stands to make more money if their “Best player” is still playing later into these warmer months. In any case , if your opinion differs and you think this contest is actually close I applaud you for at least trying to think outside the box. But sometimes you gotta go with the grain , let the current of this Russell Westbrook wave carry you to the shore of salvation. There is at least one commonality we can agree on and that is only two players are allowed to be mentioned in the conversation. Russell Westbrook and James Harden. Cases made for all other players will be fielded during discussion of rookie of the year , comeback player of the year , etcetera. Before I bombard you with the numbers I have to ask… have you ever seen a player average a triple-double? Now already I have just eliminated 75+ million millennials including myself because we never saw Oscar Robertson drop 23 p 14 r 9 a as a rookie in the all-star game. Because my father was not yet born and his father has since passed , I have not run into anyone who can recall a game they’ve seen Oscar play in. Nonetheless , to average those numbers playing close to 80 games against the top competition is impressive to say the least. You do know the devil is in the minutiae , right? Let me break it down for you. These two candidates lead the entire league in a couple categories. Points (Westbrook 31.8) and Assists (Harden 11.2) , with each player 2nd to each other in respective categories. They are close in rebounds as well, Westbrook averages 10.7. 2 rebounds more than Harden. Splitting hairs ? If Russell leading in 2 of the 3 main categories in basketball is not enough allow me to introduce the plus minus numbers. This stat, created by Jeremias Engelmann for ESPN , measures how much a player helps or hurts the team when they are on the floor. Chris Paul leads the league with a RPM of 7.88 and is responsible for 11 wins for the Clippers. Russell is 6th on this list with a RPM of 6.37 and is responsible for closer to 16 wins for the Thunder. Harden on the other hand has an RPM of 4.93 tallying 14 wins. Still close right ? Wrong. Not only does Harden average more minutes played than Westbrook he also has six other players on the team averaging double digit points per game. The Thunder only have three players with similar figures. 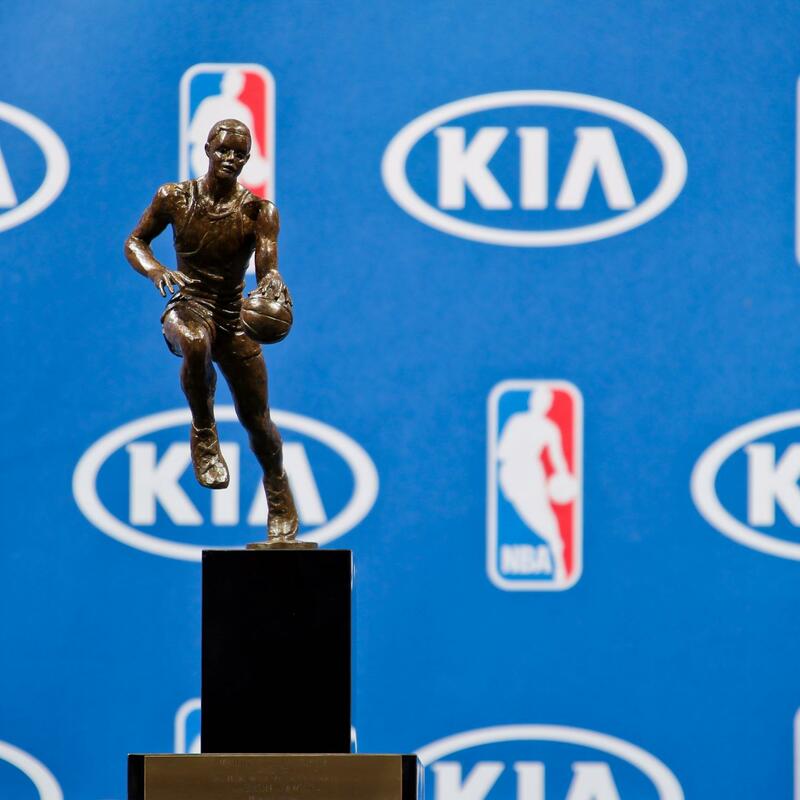 I have to remind the public that this is NOT a team award , but Westbrook is doing more with less. You go to the Thunders team page to check the statistics and you would think Russell was the only player on the Thunder’s payroll because his face is everywhere. This is a player who played alongside one of the NBA’s best at one point. The fact that he is single-handedly carrying the Thunder to the playoffs minus a former MVP should speak louder than Harden’s revolution in Houston.